Michael Krasny has been telling Jewish jokes since his bar mitzvah, and it's been said that he knows more of them than anyone on the planet. 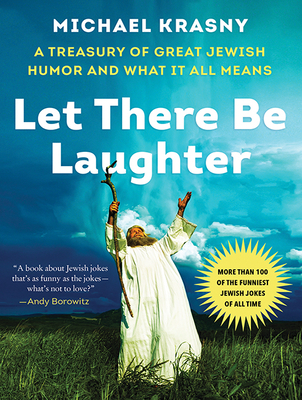 He certainly states his case in this wise, enlightening, and hilarious book that not only collects the best of Jewish humor passed down from generation to generation, but explains the cultural expressions and anxieties behind the laughs. With his background as a scholar and public-radio host, Krasny delves deeply into the themes, topics, and form of Jewish humor: chauvinism undercut by irony and self-mockery, the fear of losing cultural identity through assimilation, the importance of vocal inflection in joke-telling, and calls to communal memory, including the use of Yiddish. Borrowing from traditional humor and such Jewish comedy legends as Jackie Mason, Mel Brooks, and Joan Rivers, Larry David, Sarah Silverman, Jerry Seinfeld, and Amy Schumer, Let There Be Laughter is an absolute pleasure for the chosen and goyim alike.